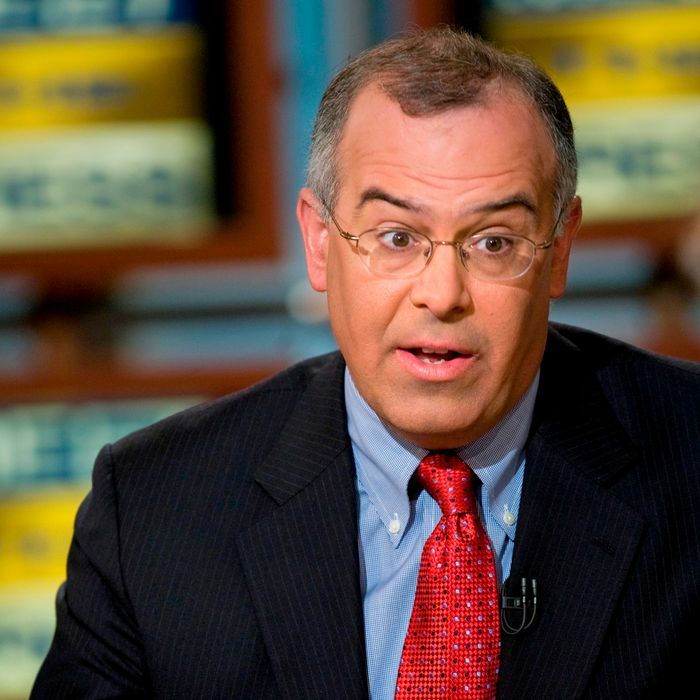 The latest offensive, or counter-offensive, in the passive-aggressive Cold War between David Brooks and Paul Krugman has taken the form of an entire Brooks column not very subtly lambasting Krugman as a tired partisan hack while justifying his own work as thoughtful, elevated, and intellectually independent. It’s unfortunately muddled and self-serving in a way that obscures some pretty important questions about how political commentators ought to do their job. Now, whether you should write about front-burner political controversies or, say, discursive observations about obscure corners of sociology is not in any way relevant to the question of whether you should be independent of partisan considerations. You can be a chin-stroking centrist commentator who relentlessly focuses on Topic A and carefully apportions blame in equal measure between the two sides. Or you can be a wild partisan searching far and wide through the mental galaxy to claim new, previously undiscovered intellectual territory in the name of your movement (see the classic Weekly Standard essay, “Why Conservatives Should Celebrate the Return of Swing”). Brooks likes to veer frequently from the beaten path of topicality. He wants us to associate this habit with intellectual honesty. But why should we? One could just as easily think of it as an evasive tactic designed to spare him from confronting the uncomfortable pathologies of his own side. Brooks goes further, smuggling into his schema notions not merely unrelated to but actually at odds with intellectual honesty. The detached writer, he argues, “sees politics as a competition between partial truths.” Well, yes, sometimes it is. On the other hand, sometimes politics is not a competition between partial truths. If you’re committed a priori to always seeing politics as a competition between partial truths, you will render yourself unable to accurately describe the times when it’s not and find yourself writing things that are provably untrue. Writing things that are provably untrue — rather than, say, being irritating — ought to be the central thing to avoid. 1. Be intellectually consistent. It’s fine — good, even — to change your mind. But you need to acknowledge it to yourself and publicly when you do so. Otherwise, you’ll end up tethering your ideological beliefs to questions that have nothing to do with them, and wind up, for instance, decrying recess appointments as the most vile abuse of presidential power since Mussolini until your own party controls the presidency, at which point you start calling for more recess appointments. A simple mental exercise to help with this is to reverse your argument whenever possible. Are you angry that the Senate filibustered a bill you like? You have to ask whether you dislike the filibuster, or just like that particular bill. If it’s the filibuster you dislike, you need to imagine yourself defending its abolition even if it means passing a bill you hate. And then you need to really do that. 2. Don’t debate straw men. If you’re arguing against an idea, you need to accurately describe the people who hold them. If at all possible, link to them and quote their argument. This is a discipline that forces opinion writers to prove that they’re debating an idea somebody actually holds. And quoting the subject forces them to show that somebody influential holds it — if the best example of the opposing view is a random blog comment, then you’re exposing the fact that you’re arguing against an idea nobody of any stature shares. This ought to be an easy and universal guideline, but in reality, it’s mostly flouted. 3. Guard against more than one kind of bias. This is my general, omnibus intellectual advice for everybody on how to think about the world, and I’ve been preparing it to offer anybody who asks me, except that nobody has ever asked. Some questions are black and white. Others are shades of gray. The whole trick is to be able to recognize both. Reflexive black-and-white moralism is one kind of bias. Reflexive equivocation is another. 4. Oh, and here’s a final guideline, though it really only has a narrow applicability: If you’re going to write a guide to opinion writing that’s completely self-aggrandizing, you should probably own up to it. Update: Brooks and Krugman fervently deny they’re at war – so fervently I have trouble believing it. To say they maybe they used to snipe at each other but aren’t right now might be credible, but the categorical denial that they have ever assailed each other in print requires some awfully naive reading. But for the record I have no proof.